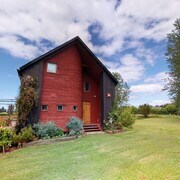 Situated in a rural location, this cabin is 0.1 mi (0.1 km) from Lake Llanquihue. Muy buena ubicacion cercana al pueblo y gran vista de la ciudad y el lago. Buen servicio y atencion. Where to find Frutillar hotels near an airport? Where can I find hotels in Frutillar that are near tourist attractions? 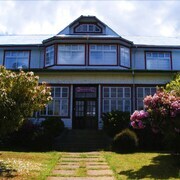 Planning to spend time in Puerto Montt? 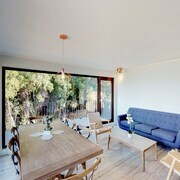 Hoping to reserve somewhere to stay in Frutillar? The center of Frutillar offers 3 Expedia-listed apartments and hotels within easy driving distance. 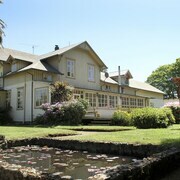 The Casa de la Oma is the closest Expedia-listed hotel to the middle of Frutillar and is only a short drive away. 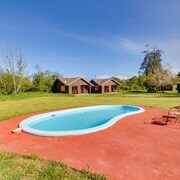 The Los Caiquenes Hotel Boutique is positioned 30 kilometres (20 miles) from the center of Frutillar. Another hotel is the Hotel Bellavista, which can be found 30 kilometres (18 miles) away. 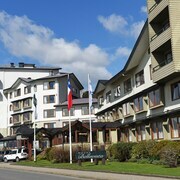 The Hotel Cumbres Puerto Varas as well as the Hotel Patagónico are two more Expedia-listed accommodation options worth looking into in Frutillar. For those who are keen to see more of the lakes, fjords and mountains that feature in this part of the world, you might also spend a few nights in other parts of Southern Chile. No matter if you engage in popular activities, for example mountain climbing, hiking and shore fishing, or just tour around to explore the attractions, you will be able to reserve comfortable accommodation in the region. While in Puerto Montt you can make a visit to the Church of the Sacred Heart and stay the night in Puerto Varas, which is 30 kilometres (18 miles) to the southeast of the heart of Frutillar. 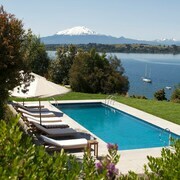 Choices include the Hotel Dreams de los Volcanes -Puerto Varas and Hotel Puelche. Before you leave Puerto Montt, ensure you catch some local sport. Visit Regional Stadium of Chinquihue to the south of Frutillar. Sports fans wanting to find accommodation close by can select from the Presidente Suites Puerto Montt or the Hotel Seminario. Now that you have learnt a little about hotels and apartments options in Frutillar, be sure to check out our Frutillar travel guide for the low-down on the many great attractions in this part of the world. What are the most popular Frutillar hotels? Are there hotels in other cities near Frutillar? 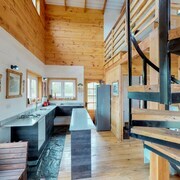 What other types of accommodations are available in Frutillar? Explore Frutillar with Expedia.ca’s Travel Guides to find the best flights, cars, holiday packages and more!